Is there anything more magical than seeing a butterfly float on the air currents and then land on a colorful flower? 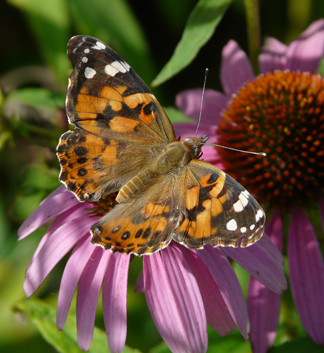 Butterflies are so unique and add so much to the landscape that many of us plant special flowers in hopes that one might visit our gardens. I have been photographing butterflies for years and on occasion the experience has changed me. My best photos have come when I slowed down enough to enter the butterfly’s world and did not rush in and try to “steal” a quick shot. As you work through this quiz, look closely at the photos and you may feel the butterfly’s presence that I felt when I took the shot. 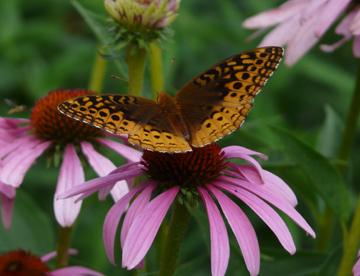 What to do: Click on the “Start” button below to take the Midwest Butterflies Quiz. Read the description of each plant and then guess its name. This is a large (4") butterfly and common in the most of the U.S. It is highly revered in Central Mexico and several states have designated it as their “state insect”. In late summer, it begin migrating from the Upper Midwest and Eastern United States to the Sierra Madre Mountains in Central Mexico, a distance of over 1700 miles. 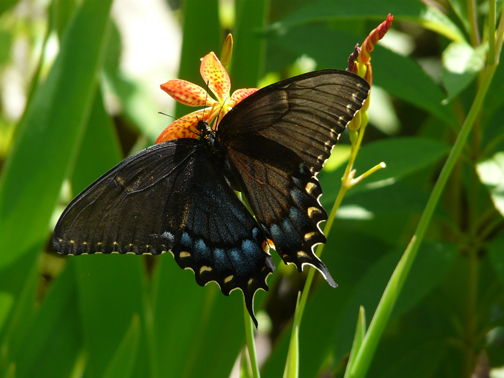 This butterfly is commonly seen in the backyard. They are considered pests by gardeners because the larvae eats various types of green vegetables. These are the largest summer butterflies. They have two tails projecting from the rear of their body. The purpose of these tails is to fool birds into grabbing the tails rather than the main part of the body, allowing them to survive another day. Groups may be seen gathering around a damp place or puddle. 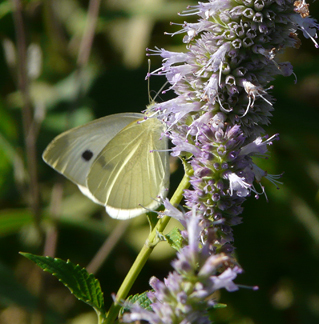 The identification of this butterfly is often confused with other species of butterflies. 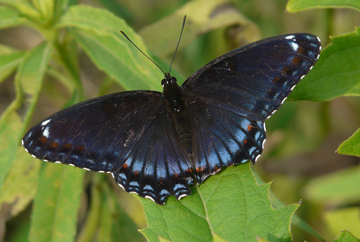 The extra black line across its lower wing is one of the identifying characteristics of this butterfly. 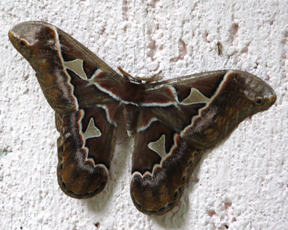 It is commonly believed to be a mimic of another butterfly that is poisonous. 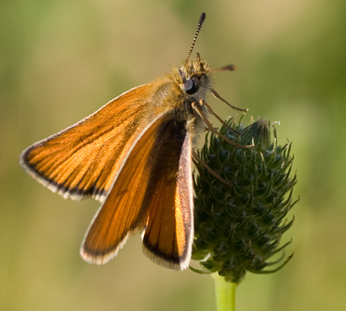 The population of this butterfly tends to increase throughout the summer, and peak in September. 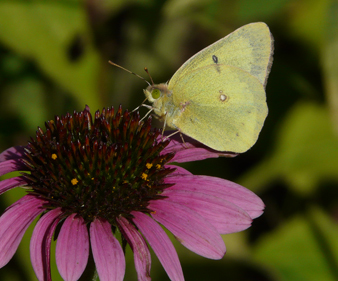 By late summer, thousands of these yellow butterflies may be seen in clover and alfalfa fields. The identification of this butterfly that can be confused with other butterflies. 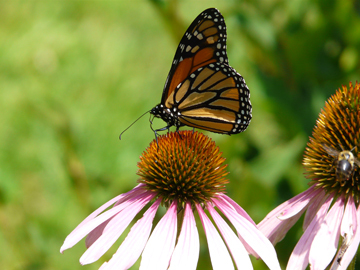 It prefers moist, open fields and gardens, where it feeds on black-eyed susan flowers, purple coneflower, milkweed and other prairie flowers. This butterfly is found in open areas of forests. When their wings are closed, they look like the bark of a tree, and when they are disturbed, they will perch on a trunk. 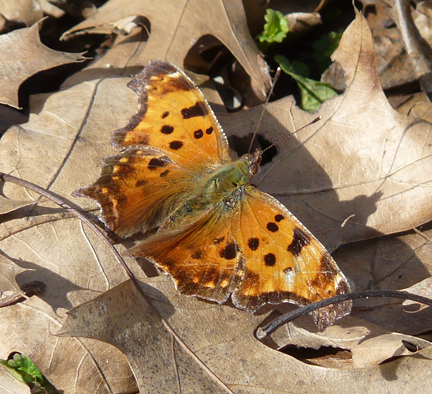 It is one of the few butterflies to overwinter as an adult. In the spring it is commonly seen feeding on the sap of maple trees. 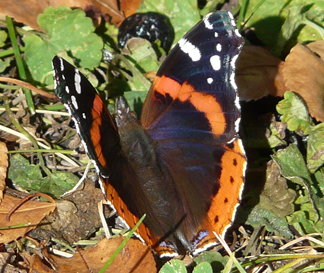 This butterfly can be told by the orange-red bands that cross its dark wings. They are found at the edge of moist woods and in gardens. It overwinters as an adult and some years their population number can be very high. 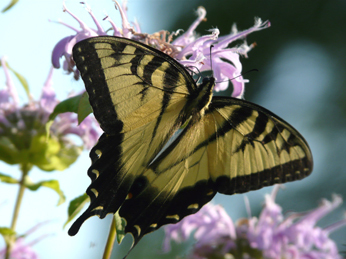 In 2001, there was a population explosion of this butterfly with hundreds of butterflies in backyards and forest margins. The following year, I only saw a few butterflies of this species. This butterfly does not usually feed on the nectar of flowers, but eats rotting fruit and plant material, dead animals and the sap of trees. There are two generations of adults each summer. In the fall, a caterpillar will roll itself in a leaf that is held together with silk and form a winter hibernaculum where it will remain for the winter. 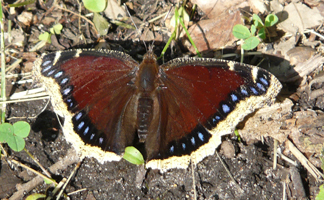 This butterfly is found in open areas of forests. It overwinters as an adult and can be seen on 50° days in the early spring. They use their dark wings as solar collectors and raise their body temperature well above the air temperature. This butterfly is found throughout North America, Central America, Asia, Africa, and Europe. Its population can be extremely high some years and other years very low. They can tolerate the cold and have been flying about on warm November days. 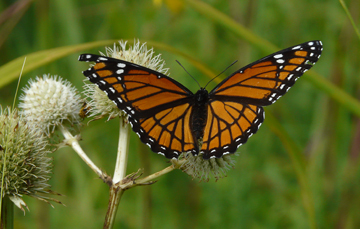 This butterfly has four large eyespots on their wings to distract possible predators, like birds. The males will perch on dirt trails or roads while seeking a mate. This group of butterflies, I commonly call “little brown guys”. They get their name from their “darting” flight behavior. This group of butterfly has been described as butterfly-moths because they have characteristics of both moths and butterflies. This moth is 5-6 inches in size and the largest moth in North America. They are active at night and attracted to outside lights. They hatch from their winter cocoons when the weather starts to warm up in late spring. The most common time to see them is from late May to Mid June. This is a day-flying moth that feeds on the nectar of flowers. They have a long proboscis to gather flower nectar. 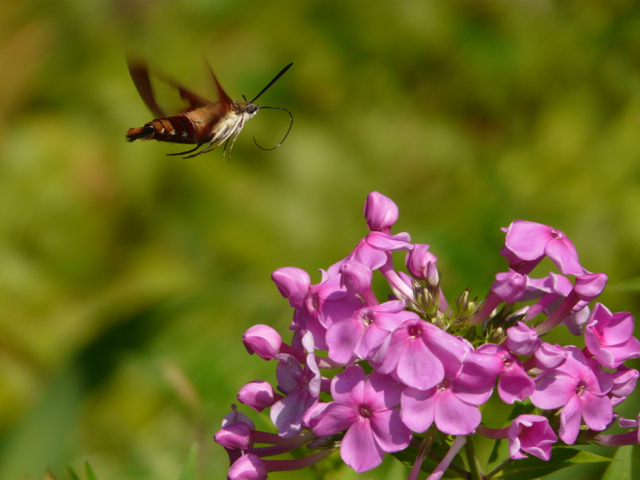 They are also called hummingbird moths because their feeding behavior around flowers resembles that of a hummingbird. Turn off that TV! Get off facebook! The earth is calling. You need more time working in the garden or studying at a prairie. Now is the time. Spending time with butterflies is time well spent! Okay, you know a lot of butterflies/moths, but wouldn't be nice to learn more? 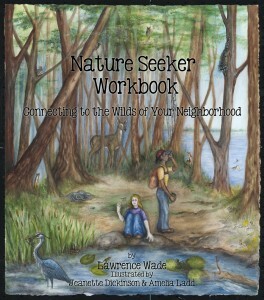 Wow, a true naturalist! Meet me at the prairie in the afternoon. missed the cabbage b’fly because the underside was too yellow-green. thought it was a sulphur! my bad!! 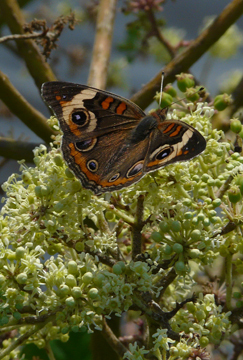 and I am a butterfly guy, not a moth guy so I missed the cecropia. not unhappy about that. was disapointed that the skipper was just “skipper sp.” skippers rule!